Apia, Samoa, December 26, 2017 – Samoa Submarine Cable Company Limited (SSCC) and Alcatel Submarine Networks (ASN), part of Nokia, are pleased to announce the completion of the marine installation of the Tui-Samoa submarine cable system, with the final splice done today, 26th December 2017. As a result, Samoa, Fiji, Wallis and Futuna islands are now inter-connected with a submarine optical fiber system which spans more than 1,470 km, providing an advanced broadband highway for inclusive social and economic growth. 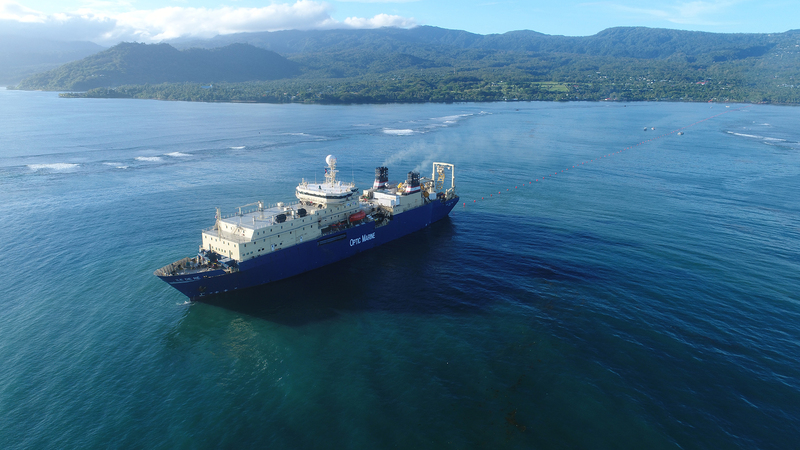 Strengthening Samoa’s domestic and international connectivity, the Tui-Samoa submarine cable system have landing points in Apia and Tuasivi (Samoa) and Suva (Fiji) and delivers a capacity of at least 8 Terabits-per-second (Tbit/s) using 100 Gbit/s transmission technology. The system also has extensions to the islands of Vanua Levu – Savusavu (Fiji) and Wallis & Futuna.